Home » lucasarts , star wars , video games » Is LucasArts out of touch with its fanbase? Is LucasArts out of touch with its fanbase? That's what Scott Kelly is wondering on his blog. What precipitates the question is the "big reveal" that happened of the next Star Wars game during this past weekend's Spike TV Video Game Awards 2009 show: a sequel to last year's Star Wars: The Force Unleashed. If we needed any confirmation that LucasArts was undoubtedly out of touch with their fanbase, the announcement of the newest LucasArts game, creatively titled “The Force Unleashed II”, has unfortunately given us the signal. I could talk about how making a sequel to “The Force Unleashed” doesn’t make sense, in a narrative sense, since (SPOILER AHEAD) Galen Marek dies at the end. I could discuss how this violates the whole “no body/no death” trope. I could bring up the fact that most fans complimented the game not on the gameplay, but on the actual story told. But I won’t. Looking across the internet, you can find people discussing just that. Now is the time to come to terms with LucasArts’ cowardice in making new, creative Star Wars games. Yes, you read it right: cowardice. With this cowardice, you’ll only see fans getting tired of the same old games that you’ll come to expect from LucasArts. I have to agree with Scott. Star Wars should be one of the most dynamic and exciting franchises in history, but LucasArts has been loathe to take risks with it and as a result Star Wars video gaming has become... dare I say it?... exceedingly stagnant. That's what happens when you keep "playing it safe" with your most prized vehicle. George Lucas and his companies should be letting it tear up the highway, not making it sit in a garage out of fear of a few dings and scratches. Because in the end it's the little quirks like that which add character to a franchise. Paramount finally understood that when it let J.J. Abrams direct Star Trek and there's no reason why it can't work for LucasArts too. Scott suggests new installments of the X-Wing and TIE Fighter series. I would love to see that. But I think LucasArts should stop being afraid to plow some new ground too. 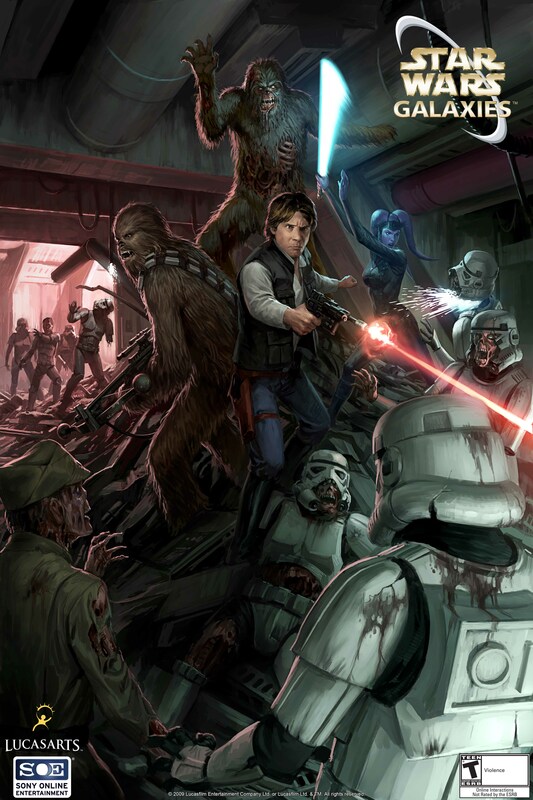 We've just had Death Troopers, the first Star Wars horror novel: something like that would make for a hella game in the mold of BioShock or Alien vs. Predator. There may not be any more Star Wars movies forthcoming, but video gaming can certainly keep Star Wars fresh and vibrant by going into sub-genres that have never been considered. A game with just Death Troopers stuff would be fun. However, they already included that stuff in their comatose online RPG "Star Wars Galaxies." At least it came with cool poster art.